Although astronomically not quite here yet, Winter has already made its presence thoroughly felt in my landscape. Recent weeks have featured a procession of gloomy, chilly, rainy days punctuated by rare sunny days followed by cold, star-filled nights. The native plants on my five acres of Piedmont have responded by going deeply asleep. Leaves lingering on towering oaks linger no longer, instead released to dance upon chill north winds until frost paints their fallen forms. 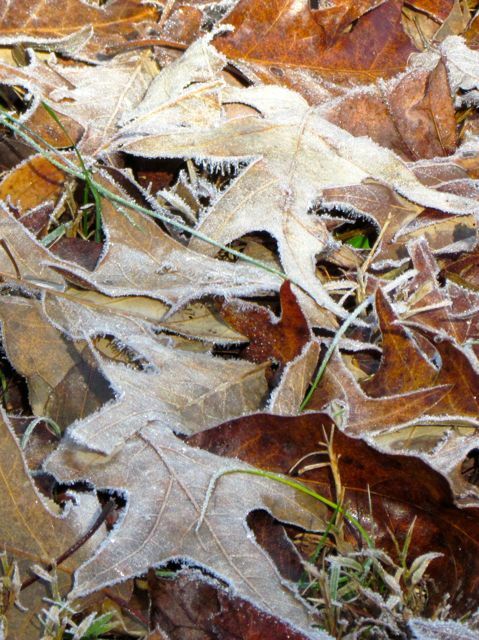 Frost lingers in the cooler spots in my yard till past noon during the cold spells. Grays, browns, and tans dominate. At least textures still vary to offer some entertainment for bored eyes. And then there are the hollies. Thank goodness for the hollies! 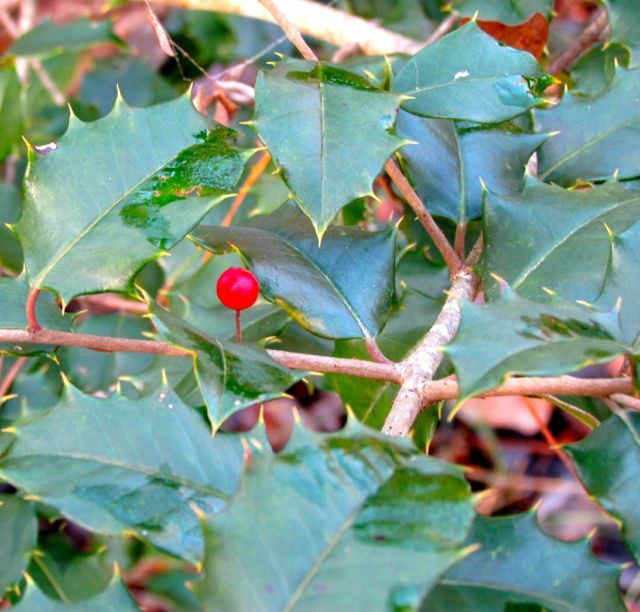 American Holly (Ilex opaca) is the evergreen holly native to my part of the southeastern US. In our native forests, it tends to be slow-growing and relatively small, often a bit distorted as it strains for light beneath a deciduous canopy. You’ll find it in any relatively moist forest, sometimes in great abundance. Birds and other animals spread seeds after devouring the bright red fruits. Well over a thousand cultivars of this native exist. Most were selected for consistent berry production and perhaps some disease resistance. A named cultivar of I. opaca that I acquired for its purported vigor. The famous plantsman, Michael Dirr, is not a fan of this native. He thinks too many, better options exist to make efforts with I. opaca worthwhile. I disagree, but my perspective is not Dr. Dirr’s. Dr. Dirr’s focus is always on the potential impact a plant will make in a home landscape. Because most folks want low-maintenance, consistent performers, ideally packing a “wow” factor, Dr. Dirr believes our native American Holly is best replaced with an English or Asian holly. The well-known cultivar, ‘Nellie R. Stevens,’ is a cross between those two non-native species, and it’s probably what most folks think of when they think of hollies in the South. 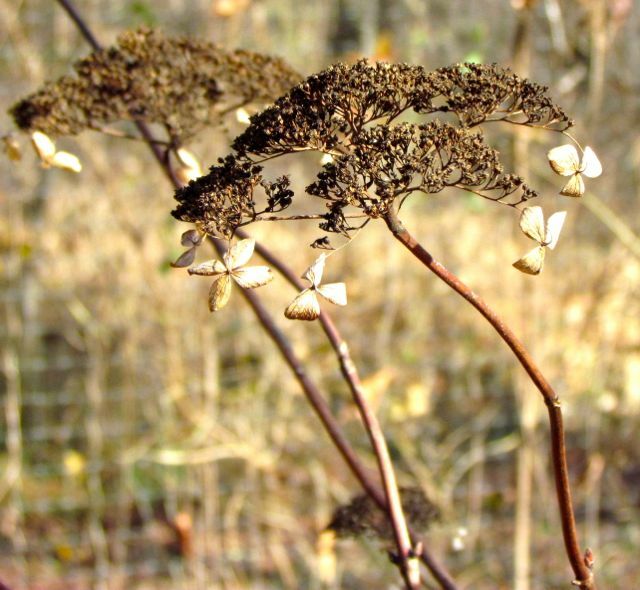 A dried hydrangea flower blends into the brown and gray winter landscape. I prefer to champion the case for our native American Holly. In the wild, it is highly variable in fruit production, leaf color, and disease resistance, but I argue that this variability is what makes every encounter with the species more interesting. As I wander my winter landscape, my eye is drawn to small islands of distant green — almost always an American Holly holding court among brown grasses and gray tree trunks. First, I look for fruits. Hollies are dioecious, meaning male flowers occur only on some plants and females only on others. For good fruit production, you must always plant a non-berry-producing male plant near your females. Holly flowers are relatively small, but pollinators find them without difficulty. During their bloom time in spring, my hollies hum with the activity of enthusiastic visitors. As ubiquitous as American Holly in the winter landscape, White-throated Sparrows animate the forest as they forage for tidbits beneath bushes and welcome sunrises with their plaintive calls. 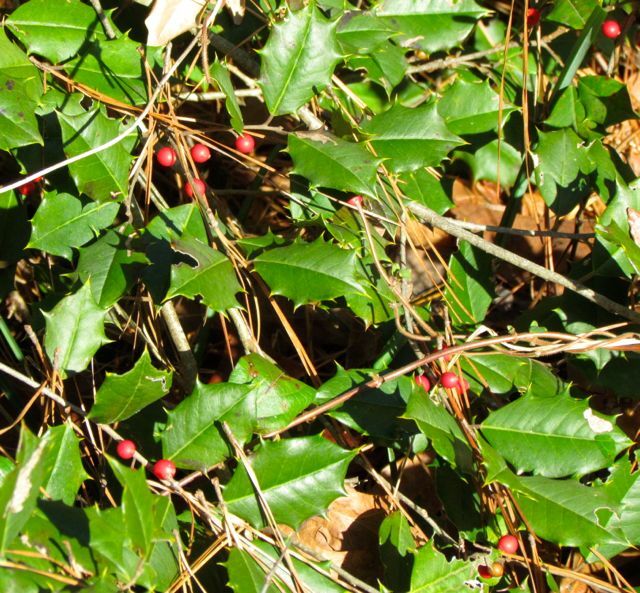 American Holly prefers moist forests, so you won’t find many on ridge tops. My five acres of bottomland, however, offer ideal growing conditions, and I find volunteers popping up from the top of my hill to the edge of my creek along the floodplain. They may not be “wow” plants, but they are beloved by local wildlife, providing food for Cedar Waxwings, Wild Turkeys, Eastern Bluebirds, Brown Thrashers, Northern Mockingbirds, and raccoons, among others. The evergreen leaves also provide shelter against winter winds and precipitation. On more than one cold winter morning, I’ve disturbed whole flocks of songbirds when I’ve unwittingly drawn too close to a holly they were using for shelter. With a whoosh, they scatter in all directions, leaving the Green Queen of the winter landscape vibrating. 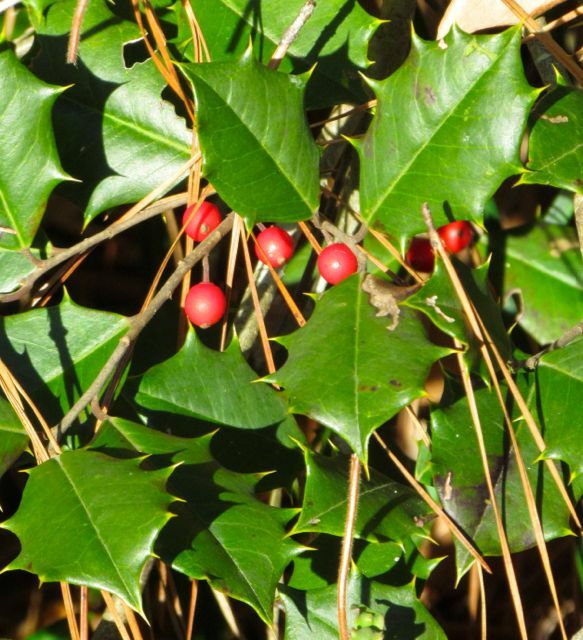 I encourage all Piedmont gardeners to find room for American Holly in their home landscapes. It doesn’t need to be beside your front door. But it would happily be part of a grouping of mixed native species that could serve as a native wildlife haven, and a welcome spot of green in a gray winter landscape. Sharp leaves protect berries from deer predation — another reason to encourage this species in your landscape. This entry was posted on December 13, 2013, 11:41 am and is filed under Favorite Plants, Native Wildlife, piedmont gardening. You can follow any responses to this entry through RSS 2.0. You can skip to the end and leave a response. Pinging is currently not allowed.